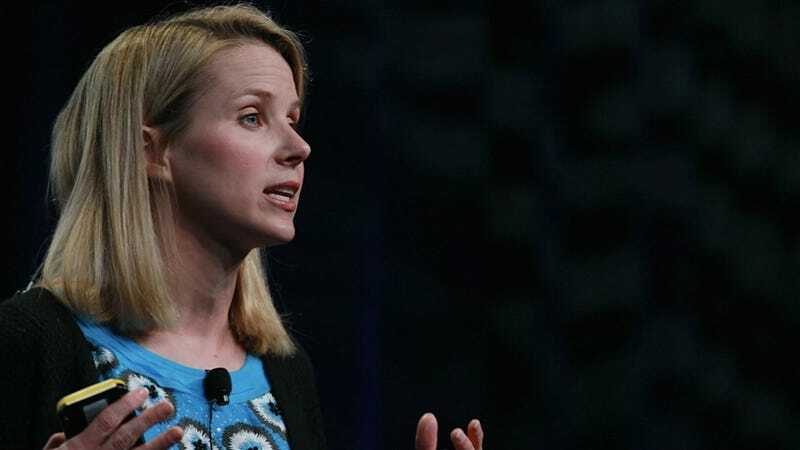 Marissa Mayer, who this week was announced as the new CEO of the Christian Slater of internet companies, is soon going to become one of those ridiculously blinged-out corporate executives that people complain about all the time. According to the Wall Street Journal, Mayer's contract is worth as much as $100 million in base compensation, stock, bonus, and retention awards over the next five years. That's way more money, the Journal notes, than either of Mayer's predecessors — Scott Thompson ($27 million) and Carol Bartz ($44.6 million) — who both left Yahoo prematurely. Deadline's David Lieberman, who reported on Mayer's compensation package about an hour before the Journal, pegged Yahoo's total offer to Mayer at $59 million, noting an annual base-pay of $1 million, an annual bonus of $2 million based on Yahoo's financial performance, an equity award of $6 million, and a $6 million stock option. Rounding out the pieces of Mayer's Byzantine corporate compensation puzzle are restricted stock units valued at $14 million (in order to "partially compensate" Mayer for leaving Google) and a one-time retention award estimated at $15 million, vesting over five years. Though the package seems really big (har-har), Lieberman explains that it isn't nearly as big as some of the "astronomical outlays we so frequently see at Big Media companies including Viacom, Discovery, Disney, and News Corp." He also points out that the SEC filing reveals Mayer's bonuses and equity grants will be subject to Yahoo's terribly named "clawback" policies, which go into effect "from time to time." Still, Mayer's getting paid a whole lot of money to help resuscitate Yahoo, which reported a second-quarter profit drop of 4 percent, as well as a revenue drop of about 1 percent to $1.22 billion. Google's second-quarter revenue, for anyone who wants a lukewarm tip, was $12.21 billion.